Alt Med Services uses the Orion® Electral Dermal Screening (EDS) unit, a computer-based system to examine the body. It really amounts to a physical from a Chinese point of view. Using Chinese acupuncture points known and recognized for thousands of years, energy levels are measured and recorded as they relate to various organs and organ systems. These readings will relay the information from the body of either balance, inflammation, or deficiency. Depending on the needs of the individual we will recommend the appropriate herbs, nutrition, enzymes, detoxifying methods, or homeopathy to bring balance back to the body. Our EDS technicians are trained natural health practitioners. For information about the Orion® EDS unit please visit Articles & Info. What To Expect: Both the client and the technician are seated at a desk with a computer, EDS unit, metal bar, and flat-tipped probe. A very small amount of electricity (not enough to feel) is put into the body when the client holds the small metal/ copper rod. The amount is just enough to energize the acupuncture points for a reading. 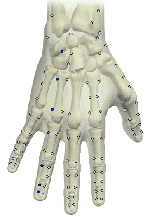 Using a small, flat-tipped probe the technician will apply a small amount of pressure to the corresponding acupuncture points located on the hands and feet. At no time are needles used in electro-dermal screening. The skin is never pierced or punctured. Aside from removing your shoes and socks, you remain dressed during the screening. Please allow 2 to 2-1/2 hours for your first appointment and 1 to 1-1/2 hours for re-testing. Re-tests are usually scheduled 8-12 weeks apart. Sometimes short or quick tests are used at sooner intervals. How often and how long depends on your body’s ability to respond and what imbalances your body is facing at the moment. It will be preferable if you bring ALL supplements or prescriptions you are currently taking. We need your prescriptions to be sure that the body is balanced with them included in the regime. If you have already purchased supplements and they test well (show that they are working for you) then there is no need to spend additional money. The cost of supplements is never known until the test is completed because until we test you we do not know what your body needs. There are some forms/questionaires needed for your first appointment. We mail them if there is time - if you didn't receive them please arrive about 20 minutes early to fill them out. A congested lymphatic system causes numerous symptoms to be expressed by the body. Congestion, when severe, results in visible edema and large areas of cellulite. With electral dermal screening and/or hand manipulation we can determine if your lymphatic system is showing signs of congestion before they become severe. For information on what the lymphatic system is and what the Lymphstar Pro accomplishes please visit Articles & Info. 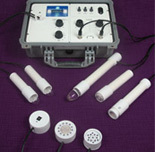 Alt Med Services uses Lymphstar Pro® technology for lymphatic therapy sessions. This instrument was found to assist and amplify the effects of manual lymph drainage, reducing the time and complexity of the therapy. Lymphatic therapy / drainage is used to stimulate lymphatic flow by removing lymphatic blockages, thus helping to build the immune system. Some conditions reported to have benefited from therapy include breast lumps, inflammation, chronic pain, joint aches, allergies, sinus, respiratory problems, headaches, prostate problems, hormone imbalance and chronic female conditions, cellulite, dental trauma, heavy metal toxicity, neuromusclar trauma, immune and fatigue. The treatment time is 45 to 55 minutes. We have a dedicated therapy room and our trained professionals will always respect your privacy while attending to your body's needs. Massage therapy holds an important role in health care by acting directly on the muscular, nervous, circulatory and lymphatic (immune) systems. It is effective in the control of pain chronic or acute, in stress reduction, and in creating a sense of relaxation and well-being. Rochelle Jones, our massage and lymphatic therapist, provides massages based on the individual needs of the client. The Cygnus Aqua-Cleanse® is a therapeutic instrument used for detoxifying the body and inducing energetic balance through an ionized water bath for the feet or hands. As toxins are released internally (through the liver, colon, and lymphatic system) and externally (through the skin), we create a “siphon effect” that can be exploited in detoxification. For information about the Cygnus Aqua-Cleanse® please visit Articles & Info. Siphon Effect? Within a few percentage points, from head to toe, our body tissue has an overall average concentration of minerals, enzymes, fluids, and toxins. Of course, some organs, such as the liver and the colon, are going to be more toxic than others. Also, as circulation is generally weaker in the legs, that is where toxins may tend to accumulate. The photo-ionic frequencies of the Cygnus will release toxins into the colon, lymphatic system, and the water your feet will be resting in so that they can be eliminated. After the Cygnus session, the concentration of toxins in the cleansing organs of the body and your feet will have changed for the better. But what about the rest of your body? The body will work to restore equilibrium between the lesser toxic areas of your body and the more toxic areas. As you repeat the therapy, more toxins will release, both internally and externally, and the level of toxins will change yet again for the better. The body will continue to work to restore a balance after those toxins are eliminated. This is how a “siphon effect” takes place in the elimination of toxins. As you repeat the therapy, the body has less of the toxins in it to equalize. This is a good thing!!! The MCC works with the endogenous oscilations of the patient providing the most personalized treatment possible. Specific programs to address the various body organs or body systems gives us the ability to target your treatment while the MCC filters out all unnecessary oscillations except for the biological window that needs to be addressed. Common clinical treatment applications include allergies, mycotic infestation, inflammation, pain, degenerative conditions, white blood cell stimulation, immune cell activily...we have access to 543 different treatment programs. MCC has opened a new chapter in the book of individualized treatments. This device will enable the biophysical and through this also the biochemical guidance of the physiologically important organs and tissues to be treated more individually. It allows the practitioner to intervene in the biological system at the deepest causal level known, on the electromagnetic control level of bioinformatics. The Lenyo is used to focus and harmonize the proper functioning of the human body by generating a low intensity electromagnetic fields at precise frequencies and amplitudes known to directly resonate with, and thus influence, specific cell and tissue types of the body. The resonance interactions are produced by both acoustic and electromagnetic signals. During bio-resonance treatments, the device emits extremely low intensity signals that are not directly perceived by the treated person, such as heat. Mild sensations might be experienced by some individuals due to the self regulating or adopting functions of the body. For information about the MCC and Lenyo Lux please visit Articles & Info. John Hammond provides this service as an effective method to reduce acute and chronic pain and to target specific organs and organ systems that need balance. Bringing the body into balance through hand acupuncture points can be done with or without needles which makes it an excellent treatment for both children and adults. There are many styles of acupuncture. Investigation and study found that there are micro-meridians located in various places on the body, including the hands. The meridians that are normally utilized on the body have referral or corresponding points on the front and back of your hands and all of the major meridians are represented on the hands. KHT was developed by Dr. Tae Woo Yoo in Korean in 1971. KHT is a very versatile therapy that allows the Five Element Theory to be utilized and meridians can be tonified or sedated. To find out which referral points on hands to take advantage of we use either a small rounded probe or a point finder that is a battery operated device. After determining the problem pain area we use a flat pellet that is centered on a small bandage (so it stays on the point). The pellets can be changed daily or worn as long as 3-4 days depending on the individual situation. WHAT ABOUT THE NEEDLES? Needles are usually not needed but there are some extremely acute pain syndromes where the pellets will not bring about the desired response. Needles could then be a possibility. The needles for KHT are much smaller than standard acupuncture needles and are only inserted 1-2 millimeters at most. KHT is not standard acupuncture! An important part of our mission at Alt Med Services is to educate the public on various health issues, remedies, and prevention. It is the responsibiity of each person to take care of the body they have been given. With so much information and the distortion of information it is important that we (the staff) and you (the owner of such body) seek out that which has been proven by life experience and that which is scientifically and spiritually sound. Profit and/or pride should never play a role in determining what is best for an individual's health care needs. If you have a subject you would like us to address please use our contact form or call - we will give it consideration when scheduling the class topics. Would you like to put on our contact list? Our contact list is used to announce up-coming events and classes and is never given to anyone else. You do not need a special license or years of previous training to become more involved in alternative health sciences. Many of our clients need lymphatic drainage and therapy sessions but are unable to travel to our office as often as they would like - purchasing a LymphStar Pro and attending a lymphatic therapy class becomes the perfect option! With training the client then has the ability to use the LymphStar on themselves and family members. The quest for health and knowledge often leads to individuals desire to help others. Cory offers training in both lymphatic therapy and Electral Dermal Screening for those who want to work in this exciting field of natural health care coupled with some of the best technologies to promote balance and health. For class schedules and more information please visit Classes/Training.